Thanks, HubSpot, for the great read! In addition to my recent blog post, Does Facebook Advertising Really Work?, where I share advice that I learned from my friends over at Webtrends and Social Fresh, I wanted to share a few more best practices with you. While creating Facebook ads may not be rocket science, there certainly are a few tips and tricks that will help to maximize results while minimizing costs. 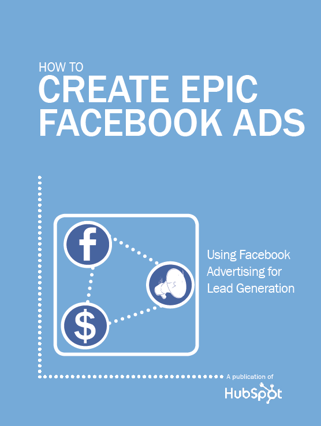 In an e-book entitled “Create Epic Facebook Ads,” experts over at HubSpot share some great ideas on how to use Facebook advertising for lead generation. While a lot of their advice was very similar to what I shared in my last post, I wanted to touch on some things that I wasn’t able to the first time around. Before we dive in, let’s toot the Facebook advertising horn. The social networking site provides one of the most targeted advertising opportunities out there today. Did you know that projections have forecast that Facebook’s ad revenue for 2011 may have been around $2.5 billion? Yowzers! Now that we’ve got that out of the way, let’s talk a little bit about how it works. Like Google ads, Facebook ad pricing works on an auction system. You’re essentially bidding on likes and peoples’ interests. This allows you to be as narrow or as broad as you’d like. Pricing can vary by how small or large your audience is, and yes, you guessed it — the more narrow the search, the more expensive the click. There’s also another relatively new form of Facebook advertising out there: Sponsored Stories. These stories enable you to advertise an individual’s action. For instance, if one of your friends likes Clairemont Communications on Facebook, we can pay for it to appear alongside your newsfeed. Pretty rockin’, eh? This phenomenon, known as social proofing, is arguably the most valuable form of advertising on Facebook and can also be less expensive. Now that we’ve covered the basics. We’d also like to share a few tips with you. Split-test your ads! It can be tough to figure out what strategy works best for your Facebook ads (it can vary from client to client, product to product, person to person). That’s why it’s important to measure what’s working, while it’s working. Remember to stay true to principles you learned in seventh grade science class, like changing only one variable at a time and keeping similar ad conditions. When you are setting up an ad, make sure to check the box next to “Show stories about people interacting with this Page with my ad.” Remember what we said about social proofing? Did you know that questions make great ad titles? Images of people tend to convert better than logos do. Don’t narrow your target to less than 20,000 unless it’s a special circumstance. That’s because Facebook will reward you with cheaper clicks when you get more clicks on your ads. May the odds be ever in your favor (and this tip should help)! Start your ads with a CPC (cost per click) bid. It’s usually cheaper than CPM (cost per thousand impressions). Facebook will do the math for you in your campaign report, so you can see which option is cheaper and make the switch, if needed. Always start your bid at the suggested bid or even higher. If you don’t bid high enough, your ad will never been seen (or maybe only three times around 4 a.m.). Don’t ignore demographics! The beautiful report Facebook will conjure up for you can come in handy, big time! By viewing your report, you’ll be able to get an idea of who is clicking on your ads, offering major target audience insight. How’d you like this second round of tips? Did you find them helpful? Remember that while Facebook ads can be extremely effective, they should be only one part of a larger, more comprehensive social media strategy — and we can help you with that! Have any questions for us? We’ve got answers!